I have been wearing this jean skirt non stop. Was a little nervous about trying a pencil jean skirt but I am so happy I did. It is a nice change from jeans. It can be dressed down easily. I also wore it with my converse sneakers to run errands. Obviously I have been on a huge t-shirt kick lately. This one is really oversized and it is really soft and comfortable. I have been living in it. I got this one in three colors. I love the jean skirt !! Your adorable ! Looking fantastic in this outfit! I like your mommy style very much, it's even more "polished" and elegant than before. 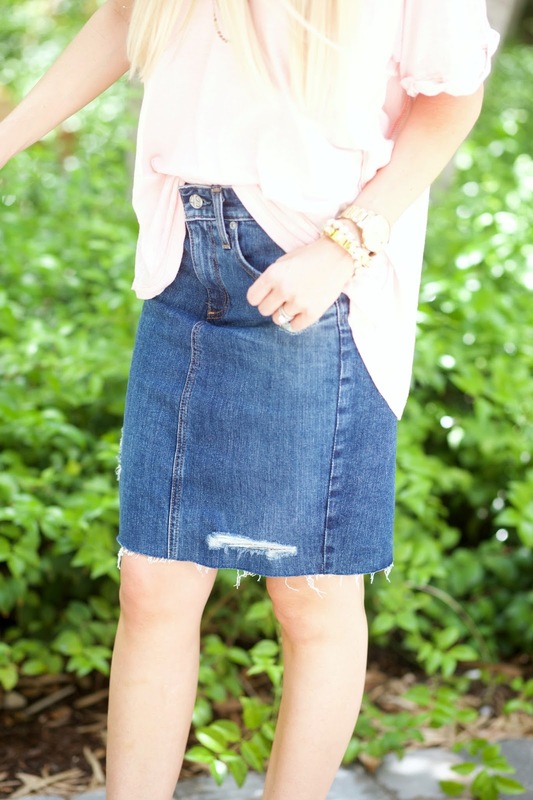 love that jean skirts are back! you look so cute! Looks very chic but also super comfy! You look so great in this. I feel like I wouldn't be able to pull off this look but you definitely do. I love your oversized tee with your skirt! So cute! Beautiful, simple look! Love your hair! Love this look and your hair looks so pretty!